When I first started trying to get my finances under control, I had no idea where to start. I tried to follow a patchwork of ideas like pay yourself first and only spend X percent of your income on rent, but at the end of the month there would always be more month than money. I couldn’t figure out what I was doing wrong until someone asked where my money was going every month. Aside from food, rent, cell phone and credit card payments, I had absolutely no idea. It was such a simple question and the answer ended up keying my turn-around financially but it took me a while to realize that mattered. So if you’re trying to turn your finances around and save a bit of money every month instead of wondering where it all went, here are the 2 best places to start fixing your finances. As I found out, the most important thing is tracking your finances. When I started turning my ship around, there wasnt a lot of good financial tracking software like their is now. I started with a blank sheet of paper and a stack of bills, working those and my online logins to figure out how much I was spending every month. It’s much easier now, with the online trackers for your finances such as mint and apps that are more investment focused, like personal capital. Once you start tracking your income and expenses, you’ll know where you need to cut and how much you can use to save or pay off debt each month. Once you get your expenses written down, I’ve found it’s most valuable to lower your structural expenses as much as possible at first. This includes things like rent, car payments, car insurance, electricity, water, cell phones and cable tv. I’ve found that many people way overpay for cable TV (Calling up and getting a discount usually works wonders) and if they switch to an MNVO like ting or republic wireless they can usually lower their phone bill by 66% or more per month. For a family of 2 if they switched phones and totally ditched cable, that’s an immediate savings of 200+ per month. Once that’s done, add all that money to your savings or debt repayment. Then it’s time to move on to your car expenses. Consider selling your car and trading in for a cheaper one that you own outright, and can carry less insurance on. This will get rid of your car payment completely and hopefully lower your insurance by a significant amount as well. Better yet, try getting a bike and getting rid of your car completely. In my opinion, those are the low hanging fruit – things you can easily change and your day to day existence wont be changed much one way or the other. The best part about this is you can spend a day or 2 over the course of a week and you should be able to easily pocket 500+ per month in savings – that’s 6,000 per year! Like you, I could use the extra 6k per year. Once you get your structural issues fixed in your finances, it’s time to move on to your habitual purchases. Is there anything that you spend too much money on and dont get a lot of value from? Do you spend too much on fast food, or alcohol? Or maybe you buy too many books you’ll never be able to read, or too many movies on blue-ray you cant watch? Now is the time to deal with those, and the easiest way that i’ve found is to get a budget set up and spend that in cash every month. Say you want to limit your blu-ray purchases to 25 bucks per month – get that amount in cash at the beginning of the month, then when the cash is no, no more blu-ray until your cash re-ups at the beginning of the month. 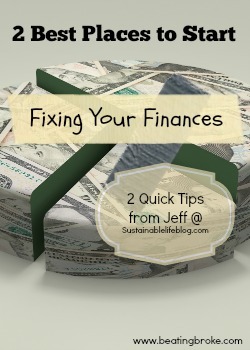 Jeff blogs about building freedom by going green and saving money at Sustainable Life Blog. I complete with your reasoning for fixing your finances. Something many people do not realize is where their actual money ends up. Then more importantly how much that money spent accumulated to.